On Wednesday, Aug. 8, it's the Open Class corps members' turn to show off their individual talents. 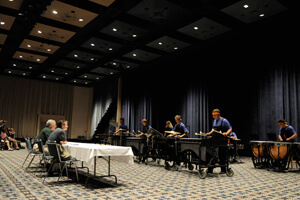 At the Indiana Convention Center, small ensembles and soloists will participate in the 2012 Drum Corps International Open Class Individual & Ensemble Competition (I&E). I&E gives corps members the opportunity to show off their individual and group talents, performing solo and ensemble pieces perfected by corps members outside of their normal corps rehearsal schedules. Even further, vocal and woodwind categories give members whose primary instruments may not be included in a normal drum corps setting the chance to perform. The event is free and open to the public. Wednesday, Aug. 8, 2012 — 2 to approximately 5 p.m. Learn more about the Indiana Convention Center. From 2 to approximately 5 p.m., members from 11 Open Class corps will showcase their talents. • Two barbershop quartets, from Oregon Crusaders and 7th Regiment, will compete head to head in the Vocal category. • A soloist from 7th Regiment will be juggling in exhibition. • In their first trip to the World Championships since 2007, Gold will have seven performances at I&E. • Two flugel horns from Colt Cadets will compete. • Open Class I&E will also feature the World's Fastest Drummer competition. • Blue Devils B's 2010 Woodwind Champion will return in 2012 on flute.